The best mexican restaurant in the northern! Extension ol Baia California! 12 servad with Ranch Dressing. The following plates are served daily, however, on the noted day of the week, the plate is $2. 00 off the regular price! ALL ESPECIALES are accompanied by rice, beans, Mexican slaw. Chunks of chicken breast grilled with onions, bell peppers. Served with rice, beans, guacamole, and pico de gallo. Chunks of flank steak grilled with onions, bell peppers and guacamole. Chunks of flank steak, sauteed with bell peppers, onions, other spices Served with rice, beans, and tortillas. Fajita combination of steak, pollo, and prawns delivered sizzling hot in its own iron skillet and served with rice & beans, sour cream and guacamole GRANDE !!! Prawns, crab, chunks of pollo sauteed in wine, butter, mush rooms, onions, tomato, topped with melted Jack, cheese, rice, refried beans, tortillas and gua camole. Chunks of chicken breast, sauteed in butter onions, bell peppers, in our own SECRET sour cream sauce and, served with rice & beans. Chunks of chicken breast sauteed with butter onions in a SPICY Mexican sauce and served with rice & beans. A large, flat, crispy tortilla filled with refried beans, your choice of meat, cheese, lettuce, avocado, tomato slices, sour cream, with red sauce. A bowl shaped flour tortilla filled with beans and your choice of meat, lettuce tomato and cheese. A bed of pol lo, ground beef, pica, or pork, topped with lettuce, cheese, and tomato, and shadowed by crispy flour tortillas. Romaine Lettuce with tomatoe, croutons, shredded parmesan cheese, caesar dressing and topped with grilled chicken breast. Six prawns sauteed in butter with mushrooms , onions , tomatoes, qarlic Served with rice, refried beans, quacamole. Six prawns sauteed with mush rooms, onions, tomatoes in a spe cial sauce. Served over a bed of rice, melted cheese. Six butterflied prawns sauteed with mushrooms, onions, toma toes special spicy red sauce. Servad with rice, refried beans. Six fried prawns, stuffed with cheese, wrapped in bacon. Servad with; mayonnaise, rice and beans. Six prawns sauteed with onions, bell peppers, Sour Cream Sauce, rice and beans. A GIANT flour tortilla filled with your choice of meat, beans, rice, cheese, topped with onions, tomato, quacamole, and sauce. A GIANT flour tortilla filled with rice, whole beans, onion, carrots, bell pepper, mushrooms, cheese, lettuce and sauce. 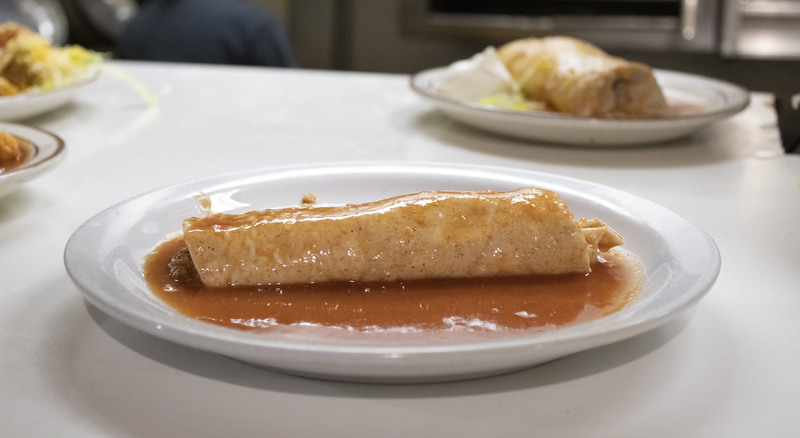 A large flour tortilla filled with rice, beans, cheese, your choice of meat topped with Casa Mexico's red sauce. Homemade vanilla custard with fried sugar topping ... Fantastico! Larqe scoop of vanilla ice cream covered with com flakes crumbs, deep fried and topped with strawberries and whipped cream. Served with rice, beans and Mexican slaw. Your choice of meat, pica, polio, pork, ground beef. Pollo is served with sour cream. A GIANT flour tortilla stuffed with beans, rice, onion, carrots, bell pepper, cheese and your choice of marinated pollo, or steak with red sauce, sour cream, and guacamole. A GIANT flour tortilla filled with cheese, sauteed onions, bell peppers, carrots and your choice of marinated pollo or steak. With sour cream and guacamole. A GIANT flour tortilla filled with rice, whole beans. Cheese, onion, carrots, bell pepper mushrooms, lettuce and sauce. A large flour tortilla filled with rice, beans, cheese, your choice of meat topped with Casa Mexico' s red sauce.